SAN FRANCISCO—“A social worker turned mayor is the best mayor ever!” said Ellen Lee Zhou, an unassuming 48-year-old mother of two college-age children, and a longtime public services employee of the city and county of San Francisco. Zhou is one of the eight candidates, and the only candidate with a Chinese background, in the San Francisco mayoral race. As the June 5 special election quickly approaches, uncertainty and anticipation have been brewing silently but surely in the communities across San Francisco. Relatively little known and thinly financed, Zhou calmly goes to work as she has been doing for the past two decades. Who exactly is Zhou and what does she stand for? The Epoch Times caught up with Zhou during her lunch break. In addition to her regular job, Zhou was on the San Francisco Civic Grand Jury for two terms (2014–15 and 2016–17), a member of the union bargaining team, and a volunteer in the Chinese community. With a slight hint of a Chinese accent, Zhou speaks with passion and confidence. Zhou has been a fierce opponent of recreational cannabis, which became legal in the state of California on Jan. 1. In fact, she was nominated by a coalition of neighborhood “no recreational cannabis” groups from 11 districts to run for mayor. After her family immigrated to the United States, Zhou paid for her schooling by doing odd jobs. She knew she wanted to help people and decided to become a social worker. She graduated from San Francisco State University in 2003 with a master’s degree in social work. After 32 years living in San Francisco, she is deeply concerned. “We have no more family values in the city. Our [population of] family and children has been shrinking. People have been leaving the city to get a better life [elsewhere]. “It’s been crazy enough for people to say, enough is enough. There are a lot of people who don’t want to see needles everywhere, robberies every day. 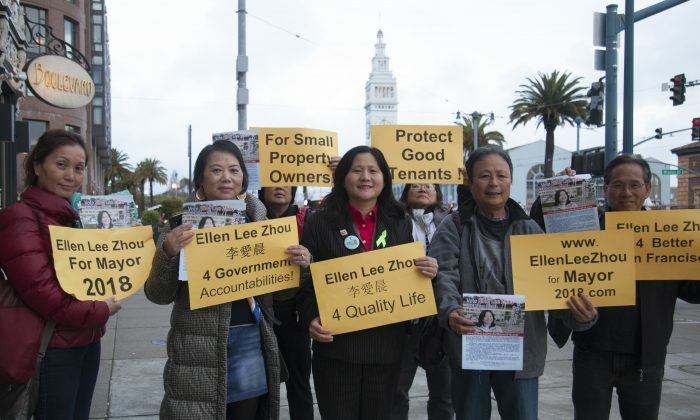 In addition to continuing the fight against recreational cannabis and stopping corruption to protect public employees and the general public, Zhou wants to protect small property owners. “I am Chinese and 35 percent of the small property owners are Asian and mostly Chinese. They have been taken advantage of and being sued for racist reasons. I want to change that. “When you have love, you will do what is right to help people from suffering. Many homeless people suffer and die on the streets. Many Chinese small property owners with limited English are being sued through corrupted activities, and they suffer from depression and anxiety.